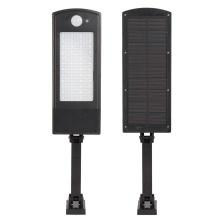 With this LED solar wall light, you can save a lot of electricity fees and protect the environment at the same time. Its adjustable bracket design makes it available to do some adjustments to create the best angle you want. No electricity bills, no tangled wires, convenient and tidy. This product relies on solar energy, which is clean, endless and environment-friendly. IP65 waterproof grade, making it possible to bear a lot of outdoor environments and weather conditions. Adjustable bracket, you can adjust the solar panel and the lighting angle to create the best daylight exposure and larger illuminator area. Using high power polysilicon plate, higher absorption, faster charging, only need 7 hours, it can be fully charged. Perfect for illumination in garden, garage, hallway, and other areas.